Did you know that the skin around your eyes is 40% thinner than the rest of your face? Did you know that is why the first signs of aging are usually laugh lines around your eyes. I prefer “laugh lines” to “crows feet.” It sounds better, don’t you think? I don’t know about you, but I don’t want to “look my age.” I turned 40 this year and I think it is a fabulous age. 40 is fabulous! Laugh lines, not so much. The answer is eye cream. The better answer is Perfectly Posh eye cream. Perfectly Posh is naturally based with amazing ingredients, no scary chemicals, and no wasteful fillers. Even better the products are cruelty free, made in the USA, and affordable! Posh has 2 eye products to choose from; Impish Eyes and Prize on the Eyes. So what is the difference? Well, let me tell you! Impish Eyes is amazing. It has a cooling roller ball, perfect for de-puffing eyes and reduce dark circles. Impish Eyes is a serum instead of a cream. This means it is a lot more light weight and perfect for oilier skin types. It is loaded with caffeine, white tea, and cucumber. These ingredients take tired-looking eyes and pamper them so they have a wonderfully youthful appearance. Impish Eyes also has jojoba oil and aloe vera; these ingredients are hydrating and non-greasy. The CoQ10 reduces the appearance of fine lines and wrinkles. To apply, you use a small amount in small circular motions from the outside of your eye (along the socket) toward your nose. Use it morning and night! Prize On The Eyes is our newer eye product and is a cream. It is part of the Look Natural line and is vegan and free of colors and synthetic fragrance. It helps give the skin cells around your eyes a rest. CoQ10 boosts the appearance of collagen, tones, and improves the texture, giving a more even-looking complexion. It is very hydrating; loaded with ultra-moisturizing sunflower oil with a shea butter base (everyone who loves soft skin knows shea butter rocks!). Twice a day, use a pea-sized amount and with your ring finger (because it applies the least amount of pressure) gently tap from outer eye toward your nose. Why do we go from out to in?? This helps elasticity. The other way stretches your skin. That is bad. I don’t think I look 40. Thank you Posh! Did you know you can layer these 2 products?? Yup! I do exactly this! I love and need the cooling roller ball of Impish Eyes. It helps reduce the dark circles I have. Prize on the Eyes helps “plump” my thin eye skin, giving me a less hollow look. They work together giving me that awesome “You don’t look 40!!! !” reaction I really love hearing. You can also use Impish Eyes in the morning and Prize on the Eyes in the evening if you want the benefits of both without laying them. If you have any question ask away! I love to help! The other day I went to the local drug store to buy hair dye to cover those pesky grey hairs change it up a bit. While I was looking for the best deal I noticed a product I had never seen before, Splat Color Gel. This product claims to have extreme hold, have great color, and washes out with shampoo. I got very excited since my kids love to color their hair different colors but I prefer it to be temporary since they are a bit young still. I had to find a color that would appeal to both the boys and the girls and would look good with each skin tone (yes, I think of stuff like that). I opted for Cold as Ice (blue). The gel really does have extreme hold. 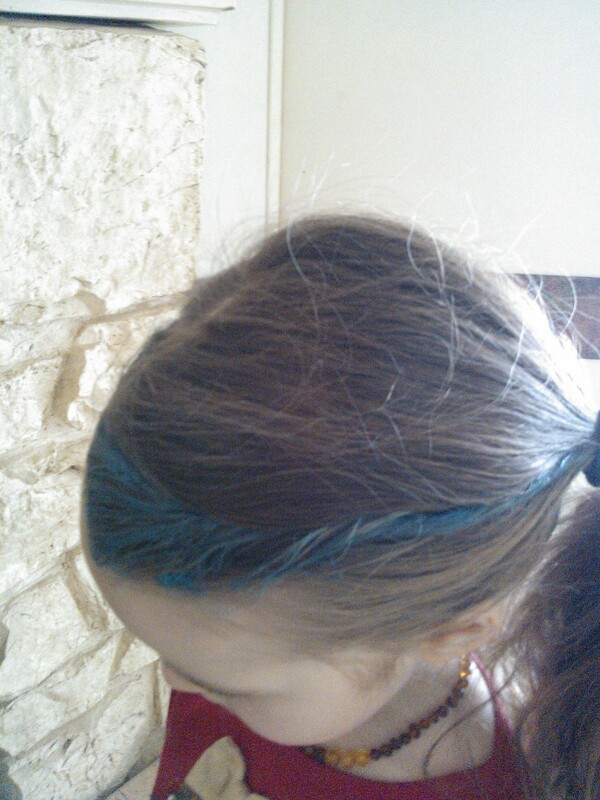 My kids’ hair is a bit fine and tends to lose the style if the gel isn’t like glue. This wasn’t as sticky as hair glue, but held just as well. I liked that. Two of my kids have brown hair and 2 are blonds (the baby did not get hair gel) and I have black hair. The product does state darker hair may need several applications to achieve the desired color. They aren’t kidding. I will post pictures below so you can see. 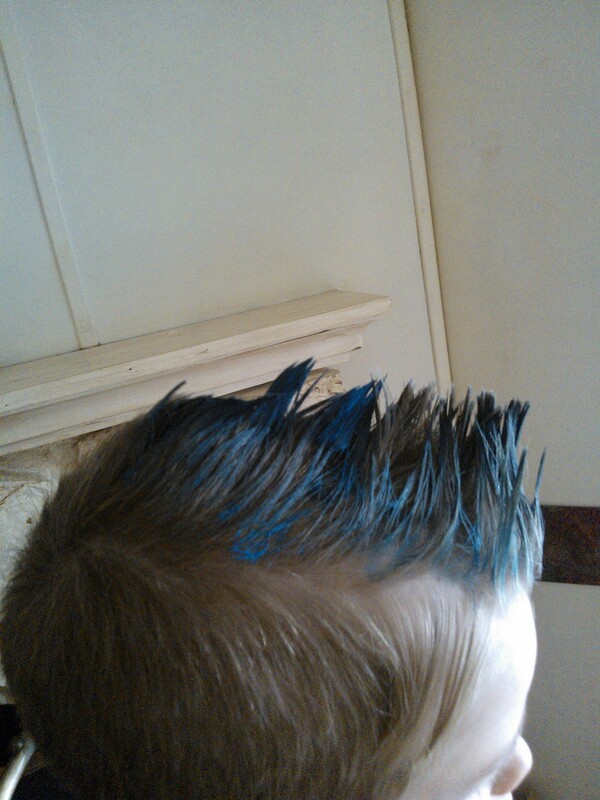 C-Dog’s hair turned out the best. He has short, blonde hair so we gave him a spiky mohawk. It held all day and it wasn’t too stiff. The color looked great. Elf’s turned out pretty good but I had to apply the color gel 4X to get the color right; she has brown hair. 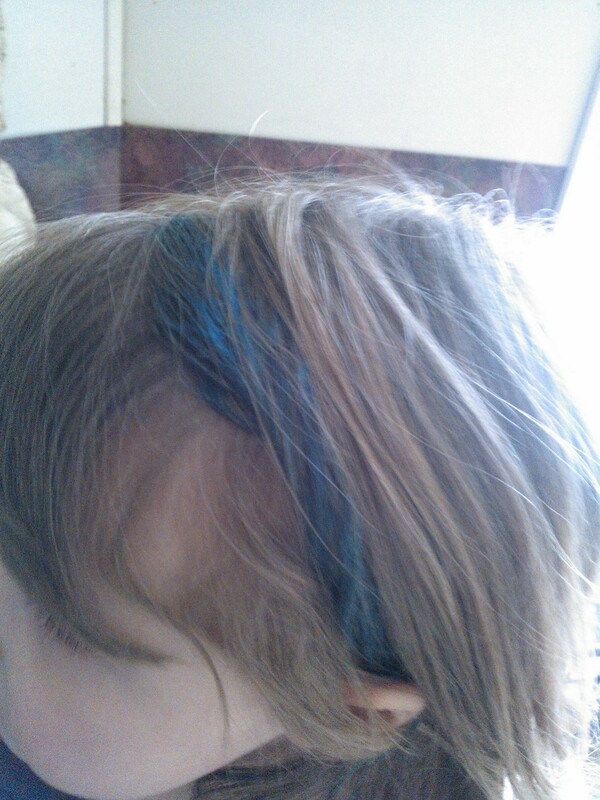 I only colored 2 sections, one on each side of her head, and twisted them into a ponytail. Her hair never stays in a pony tail. I am always fixing it. I didn’t have to fix it even once! I really liked that! Bug’s didn’t turn out great. It wasn’t terrible, but it wasn’t impressive either. He wanted streaks. 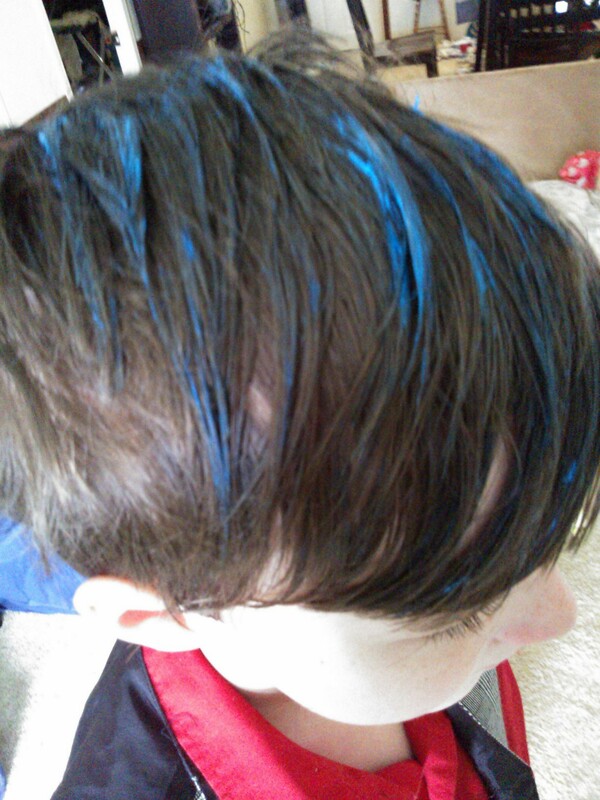 I think it was user error though as I had no clue what I was doing and he was the first to get the color gel in his hair. I think I will have to try it on him again. 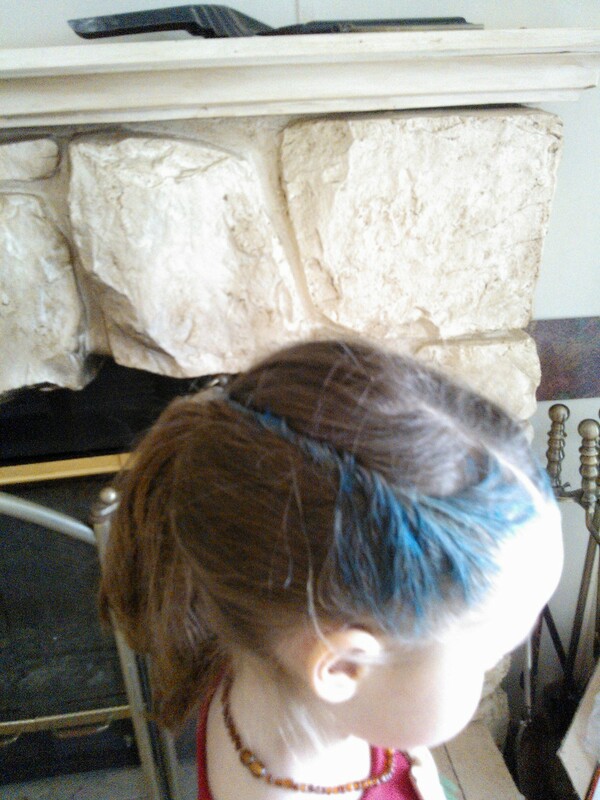 Princess is still little so I only did one section and twisted it into a hair barrette. She favors a side part so it looked cute and was thrilled I let her be like her older siblings. I didn’t take a picture of mine, but I will tell you I was not impressed with how it looked in black hair. You need too much too get the color to be noticeable. I was disappointed, but I think I will try again with a different color. I was a bit messy applying the color gel. It washed off foreheads easily. It also washed off my hands easily. The wash cloth I used to wipe foreheads did not stain and it is a cream color! Yay! I am all about products that don’t stain. Now, if you use this product and it stains, don’t blame me. I am merely sharing my experience. The color gel also washed out of the sink with just water. We all slept with the gel in our hair. It didn’t get on our pillows! Yay! The next morning we all washed our hair. I had no problem getting it out of my hair or Princess’ hair. The older 3 washed their own hair and had no issues getting it out also. We looked all clean and spiffy for church. Overall I am going to say I really like this product. As a gel it holds great but doesn’t have the very hard feeling hair glue has. As a color it is decent. It looks best in lighter hair, but it does work on dark hair. I would not recommend this for daily use. If you want color every day I would try a more permanent product. It didn’t stain for me and washed out easily. I think I will give this product a B.